Photo courtesy of Paul P. Reuben. 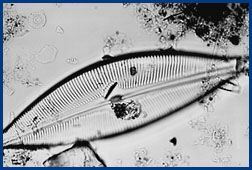 What Winkler found:Cymbella cuspidate, a species of diatom, an alga with a silicon shell. Can the mud at the bottom of a lake tells us what happened in the distant past? In 1845, when the philosopher Henry David Thoreau, gazed into the depths of "the clear and deep green well" known as Walden Pond, he could only wonder about its deepest secrets. But where Thoreau left off, modern science has picked up, and from the depths of Walden curious scientists have reeled up an ecological record that stretches back 600 years. This record of past environments -- assembled from an analysis of frozen core samples (defined) of Walden's sediments -- was taken by Marjorie Winkler, a paleoecologist at the University of Wisconsin-Madison's Center for Climatic Research. Winkler studies lake and pond sediments, and from them she extracts detailed physical records of changes in environments and climates that extend back hundreds and sometimes thousands of years. "The remains of the past are well preserved in pond and lake sediments," says Winkler. "Such things as pollen, leaves, windborne bits of charcoal, seeds, aquatic plants and the remains of microscopic animals are deposited layer upon layer and are there to be dated, identified and interpreted." Divining the Walden sediments, Winkler saw that the pond and the lands around it underwent a series of changes -- many induced by humans -- that left their signatures in the pond sediment. An analysis of pollen from the Walden core sample, for example, reveals changes in the composition of the forests of the region and even pinpoints in time the advent of settlement by Europeans. "A rise in ragweed pollen in the sediment is the time marker of European settlement at Walden Pond," says Winkler. "It increases along with grass and as tree pollen decreases, indicating the clearing of land for homes and farms and the demand for wood for heating and building." Probing the sediments from many lakes and ponds, Winkler has been able to uncover clues to past changes of climate. By studying the kinds of pollen, diatoms (defined), and other materials in the layers of sediment, scientists can determine how plant communities shifted in response to climate changes and how lakes levels rose and fell with time. There are 1 2 3 4 5 6 7 8 9 documents. ©1999, University of Wisconsin, Board of Regents.